Alvvays released their addictive self-titled debut in 2014, and it easily slid into our top 5 best albums of that year. And though three years feels like a lifetime falling into the abyss, Molly Rankin’s soaring optimism on “Archie, Marry Me” and “Ones Who Love You” still shine absurdly bright, a reflection of the group’s thoughtful songcraft and layered guitar work. This adoration is to say we (please) want a sophomore album and we (please) want it now. This demand doesn’t seem entirely unrealistic; the quintet apparently wrapped a session in the recording studio last Fall and has been playing new tracks with regularity. A few of those made the setlist last week at Wonder Ballroom in Portland, as Alvvays opened the first night of Red Bull Select Sound’s 3 Days in Portland celebration. The songs notably took on a few slower moments and allowed room for keyboardist Kerri MacLellan’s riffs to rise. The show also included lo-fi trio The Courtneys on the bill with local openers Candace, who specialize in atmospheric pop. 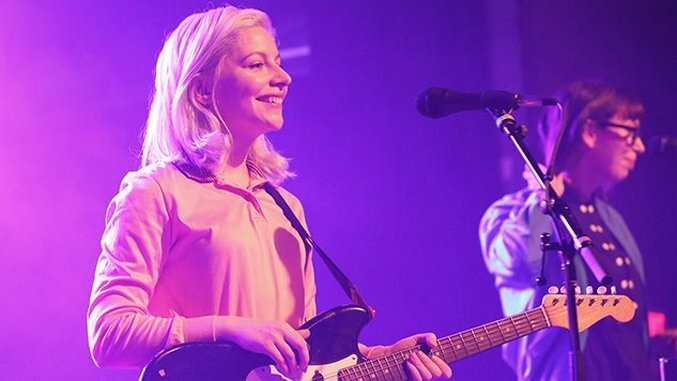 Check out pictures from the event in the above gallery, which will have to tide us all over until we get a release date for Alvvays’ new record.